The Data center-services at Micropoint offers the wide range of Data center infrastructure and application / server hosting services to run at its optimum performance Micropoint extends its services to achieve the safest and secured architecture for the hosted infrastructure. Great hosting means having power, control and peace of mind. And that’s how RailTel`s customers feel when they trust our certified NOC team to manage their hosting needs and challenges. Increased demand for IT functionality has driven considerable and rapid data center growth for many organizations. This has happened on Ad-Hoc basis with higher support and operating costs. We help our clients to evolve their data centre strategy and create a converged infrastructure that embraces virtualisation and delivers a highly secure and reliable environment. Our next-generation data centers with autonomics and orchestration capabilities aid in creating unified experiences. 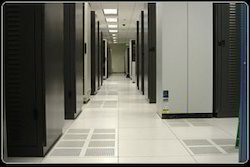 Datacenters are the backbone of effective IT operations. Managing them on a 24/7 basis is critical. Sundaram Infotech provides data center management services to enable smooth and effective data management and IT Infrastructure management. Our know-how in setting up and maintaining data centers offers effective value proposition to the customers, lowering their data management costs.